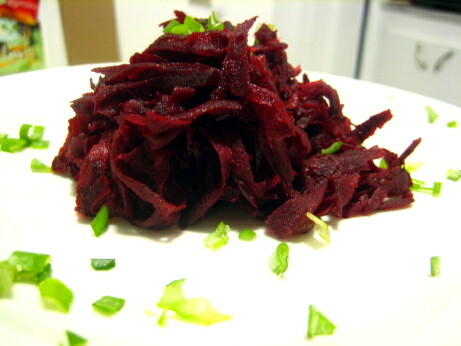 This was a very simple, and highly effective preparation for beets. My dining companion is mildly obsessed with beets, and we certainly eat more of them than the average couple. We tend to stick to Ukrainian, or Eastern European preparations, or pair them with goat cheese in salads. This week a friend brought an Egyptian preparation of beets in Mediterranean yogurt to a pot luck which was just delicious. We’d never considered trying this recipe’s method before, but I think we will again. The beets are shredded, simply sautéed in butter with lime zest, then tossed with a little more butter, lime juice, salt, and pepper, and served with chopped scallions. The Good: This was remarkably simple, and unexpected. Beets don’t make me think of limes. Beets and some type of acid makes perfect sense, but limes have got such a particular tropical floral scent that I’d just never considered them working with beets. 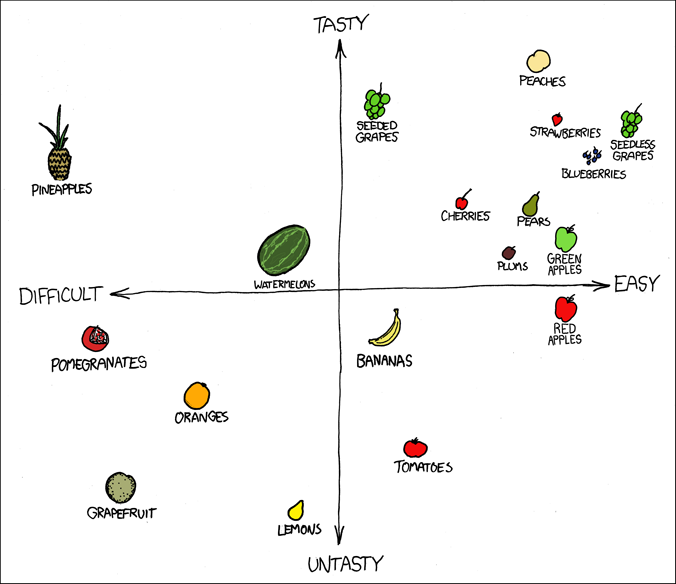 In the end the sweetness of the limes and of the beets played very well off each other. There was just enough butter to make this dish cravable, but it remained quite light, and although my picture doesn’t really do it justice it was a very striking dish. I was very pleased that this took all of fifteen minutes to make. The Bad: I have nothing bad to say about the final dish. It was simple, satisfying, and very tasty. The only downside to the preparation is that grated beets tend to stain. Beet juice comes off counter and floors nicely, but clothes can be a bit of a problem. I would also recommend using a plastic cutting board. It’s actually a good check to see if your cutting board is getting too old and scarred, the beet juice will rinse right off the surface, but any deep groves will be stained purple. The Verdict: We’re fond of beets and serve them to all comers at our house. We’ve had several guests who were kind of tentative about beet eating when they arrived, but most of them have become converts. If beets aren’t one of your pantry staples this is a nice introduction. I thought it was a bright, fresh, and wholesome, take on one of our favourite vegetables. Here’s a very simple and quite cool looking preparation for acorn squash. All you do is mix bread crumbs, thyme, salt, and pepper in a bowl. Melt butter in another bowl, and dip slices of acorn squash first into the butter, then coat with the bread crumb mixture. You then bake the squash slices for about 20 minutes. The Good: I wouldn’t have guessed that acorn squash and thyme had such an affinity for one another, that was a very pleasant surprise indeed. Baked bread crumb toppings are generally good things, and this was no exception. 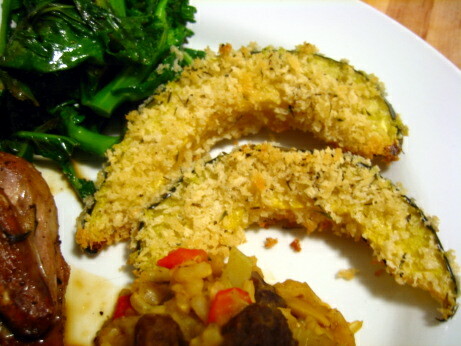 The Bad: I didn’t have any regular bread crumbs, and decided panko would be an acceptable substitute. I didn’t consider that because panko is so much lighter and has much more surface area than regular dry bread crumbs, it cooked much faster. When the recipes recommended 20 minutes in the over were up my bread crumbs were starting to burn so I had no choice but to pull the squash out. Unfortunately the interiors of the squash were still quite firm. I had to nuke the squash to get it to soften up. The bread crumb topping survived the trip through the microwave better than I would have expected though. The Verdict: While the panko substitution was my fault, the cooking time for this recipe was too short, and that’s The Book’s fault. The flavours were excellent, and it was a very simple way to make an impressive looking side dish. I’ll certainly be making this again, but I’ll stick a little closer to the instructions next time. I like to think of quail and lobster as perverse challenges on a Japanese game show. They’re complicated and messy to eat, but you’re challenged to do it in your finery with your peers looking on. I can imagine the quiet golf claps from the spectators as you deftly separate the leg joint, and the derision of the judges and jeers from the peanut gallery as you forget your manners and start gnawing on the wings. There are loads of public forums for messy lobster eating, where plastic bibs rule and squirting lobster juice into your dining companions’ hair is considered to be all part of the fun, but very few community organizations seem to throw an annual quail bash, so I prefer to keep small fowl eating confined to my home. These quail are supposed to be semiboneless, where your butcher has removed all but the wing bones, and the drumstick. I’m sure that would make the eating a lot neater, but it probably costs an arm and a leg, so we ripped our meat off the bone with our teeth thank-you-very-much. The boned out quail are cut in half, rubbed with salt, pepper, cayenne, and allspice, then chilled for a hour, and cooked under the broiler. 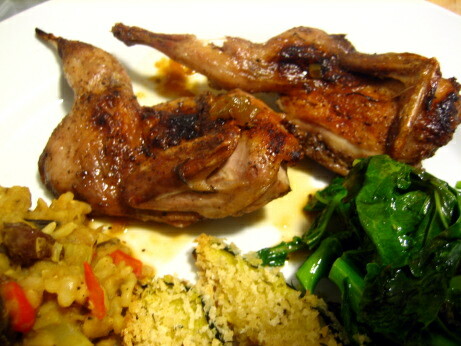 The quail are served with a gastrique made with chicken stock, lime juice, molasses, scallions, and butter. The Good: These quail were just delicious. The spice rub did very nice things for them, quail are fairly flavourful birds, so they were able to stand up to the allspice and cayenne. The quick broiling they received was a really nice way to cook them. Unlike chicken you’ve got to cook them as quickly as possible to get the outside nicely crisped before the meat gets overdone, intense direct heat from the broiler seems to be the ideal solution. They’d probably work well quickly grilled over an intense flame. The Bad: While there was nothing wrong with the gastrique, I thought it was more or less unnecessary. The quail were a complete package on their own, they weren’t begging for an acidic caramel sauce. I tried some of the gastrique with the quail, and it just covered up some of the bird’s deliciousness. Sometimes I think people make gastriques more because they look nice drizzled decoratively on the plate, or painted on with bold brush strokes than any underlying culinary theory. In this case they didn’t do much for the quail, so I’d skip it. However it might depend on what you’re serving it with, a sweet and acidic sauce like this can go a long way towards tying a meal together. The Verdict: Make the birds, skip the sauce, eat with close friends and loved ones, don’t worry about making a mess. This is ice cream for the lazy, if you have an ice cream maker you can get this cheesecake version will only take up about 20 minutes of your time. There’s also less decision making to do. For regular ice cream you make a custard and heat it until it just coats a spoon, about 170 degrees. This can be a bit of a trick if you’re rotten with a thermometer, or don’t know what nappé is supposed to look like. This ice cream does away with all that, it’s just chopped strawberries, cream cheese, sugar, milk, lemon juice, a pinch of salt, which go for a spin in the blender. You then stir in heavy cream, and chill the whole mixture. 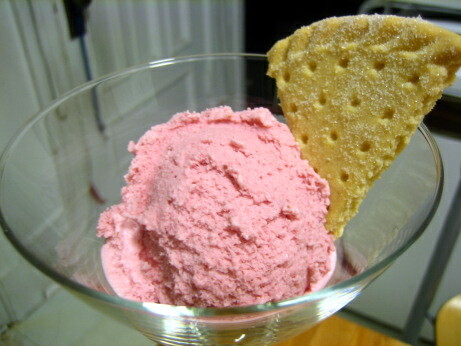 Once it’s cold you add it to the ice cream maker, churn it, then pop it in the freezer for a couple of hours to firm up. The Good: This ice cream tastes like strawberry cheesecake, only colder. The cream cheese added richness and tang to the ice cream, and accounted for a whole lot of the flavour. The strawberries were very present, but just like in strawberry cheesecake they didn’t taste much like strawberries anymore. I’m not sure why that is, but I find that through some alchemy they stop tasting like strawberries and start tasting like strawberry cheesecake somewhere along the way. That is in no way a bad thing, strawberries are great, but so is strawberry cheesecake. The Bad: This ice cream tastes like strawberry cheesecake, only colder. My dining companion isn’t into strawberry cheesecake, or strawberry desserts in general, I had a lot of this stuff to go through alone. The texture was also a bit off. It was very thick, probably from the cream cheese, and set up quite firmly. I would have preferred a creamier, more yielding ice cream. I skipped the chilling step after the ingredients are blended together, and went straight to the freezing step. The point of chilling the base is to help it freeze as quickly as possible when it goes into the ice cream maker. Faster freezing means smaller ice crystals, means a smoother creamier texture. It’s possible that my issues with the texture were a result of my shortcut, but I don’t think so. The mouth feel was good, it wasn’t gritty or grainy as ice creams that weren’t frozen quickly enough can get, so I suspect the texture is due to an excess of cream cheese. The Verdict: It’s ice cream, it tasted good. On an objective – is this something you would eat again?, level the answer is absolutely yes. But, there are only so many ice cream making opportunities in life, and I think my time could be better spent. I can’t find a recipe for this one online. Anyone following The Project for any length of time knows that I have a bit of a smoked pepper fetish. I get a little weak in the knees when I see the words “ancho chiles” in a recipe. You start this recipe by searing and soaking anchos, then puréeing them with garlic, onion, oregano, and dash of water. The paste is then fried and thinned with white wine, white vinegar, sugar, and salt. 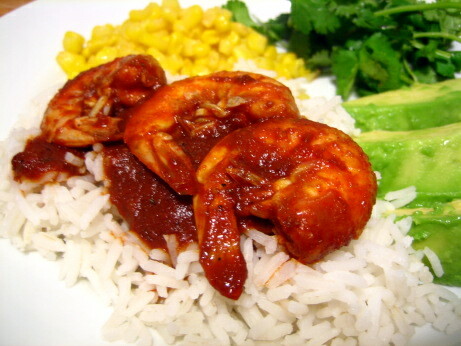 It’s simmered until it’s quite thick, and shrimp are mixed in and cooked. You serve the dish with rice, avocados, and cilantro. The Good: I’m a sucker for spicy seafood dishes, and this was a lovely way of doing it. It tasted like an actual Mexican dish, and very little like the pathetic excuse for Mexican food you can find in Montreal (with a very few exceptions). I’m an enormous fan of adobo sauces like this because they combine heat, smoky depth, acid, sweetness, and aromatics in one cohesive sauce. It hits all the buttons there are to hit, and leaves me very very satisfied. The Bad: I’m getting pickier about my adobo sauces, and while this was generally good, I’ve had and made better. My main issue was that there was too much ancho flavour, without enough else to balance it. The smokiness of anchos is wonderful, but it can be overwhelming if it’s too concentrated. I also object to the use of white vinegar, there’s nothing wrong with it, but it’s a missed opportunity, lemon or lime juice would have added another dimension, and white wine vinegar could have been a nice choice too. Similarly, white sugar is just fine, but honey, molasses, or brown sugar could have been more interesting. While it’s not in any way the recipe’s fault, I decided to get clever and messed this dish up. It annoys me that most recipes call for peeling and deveining shrimp. The 21-25 shrimp called for in this recipe are small enough that eating the vein doesn’t really bother me, getting rid of it is a nice touch, but it’s not strictly necessary like it is with larger shrimp. What really kills me is getting rid of the shells. A huge amount of the flavour in shellfish is in their shells, and throwing it away is just no fun. I usually try to find a way to simmer the shells in some liquid going into the dish to boost the shrimp flavour. In this case I decided that my dining companion and I would just peel our shrimp after cooking. That was incredibly dumb, they were extremely messy, and we ended up losing a lot of the sauce along with the shells. The Verdict: My love for all things in adobo continues, this wasn’t my favourite example but it worked fairly well, and it’s a good basis to start experimenting from. It took a little while, but no step was too frustrating. The final plate was lovely and colourful, and the cilantro and avocado were excellent compliments to the shrimp. I’ll absolutely make dishes very much like this one again, but I don’t think I’ll be following this recipe letter for letter again. You know how it goes. You get ambitious and decide to make coleslaw for that barbecue you’re hosting, and think that you should buy a big cabbage because so many are coming to this to-do. You get home and start slicing the cabbage only to discover that half of it fills the biggest bowl in the house, so the remainder goes into the crisper to quietly decompose until you can feel good about throwing it away. This recipe is the solution to your cabbage problem. The Good: This recipe takes 20 minutes start to finish, and it gets rid of that cabbage. 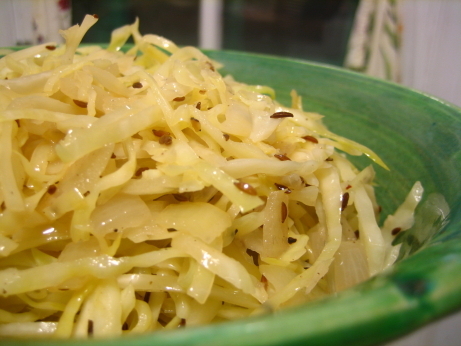 Slicing the cabbage very finely (use a mandolin if you have one) and sautéing it quickly doesn’t give it time to develop that sulpherous stink most people would rather avoid. It’s cooked with onion, caraway seeds, salt, pepper, and a squeeze of lemon juice at the end. The carraway worked really nicely with the cabbage, it’s not a spice I think of using often, and I like to see it on things other than bread. My dining companion really liked this dish a lot, it appealed to her Ukranian roots, and I have to agree. An underappreciated virtue of cabbage is that it’s exceedingly inexpensive. What with the price of food these days, why not integrate more cabbage into your diet and save your shekels. The Bad: There weren’t many bad points about this recipe, it’s very simple, with no surprises. The world is full of reflexive cabbage haters, if you’re one of them this dish won’t change your mind, but for the rest of us I thought it was a winner. It could have used some colour though, shredded carrot comes to mind. The Verdict: This is a recipe I’d be willing to go out and buy a brand new cabbage for. It’s got a definite place on the menu at our next pierogi party (we probably have three a year, not counting the nights we just have them for dinner). I wasn’t expecting much from such a simple recipe, but it really worked for me. I served these sweet potatoes along with Lillie’s North Carolina Chopped Barbecue , and they were a lovely accompaniment. I should have though about the colour palate of our dinner before pairing sweet potatoes and barbecue, the plate was a little orange. You may eat with your eyes first, but the important bit is what happens when you put it in your mouth. On that score these potatoes did very well. 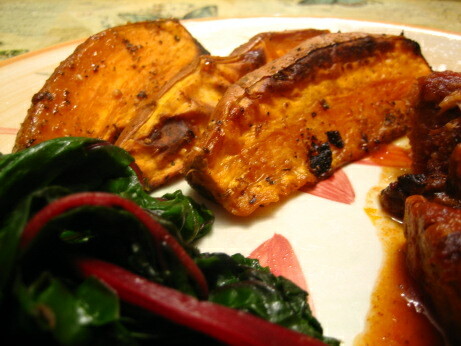 The Good: These sweet potatoes are delicious, simple, and in most other contexts very good looking. A child could make them, you just cut sweet potatoes into wedges, toss with ground coriander, fennel, oregano, red pepper flakes, kosher salt, and oil, and roast for 40ish minutes. It’s an unusual combination of spices, but they worked unexpectedly well together. The Bad: Wedges are a popular food shape because they’re easy to cut, but they cook very unevenly. The thin edges of the sweet potatoes started to dry out before the interiors fully cooked. This was less of a problem with smaller sweet potatoes, but with any bigger onces I’d try a more uniform shape. I’d consider using a baking sheet you don’t like much for this dish because there was a lot of burned on spices and oil that were difficult to get off. The Verdict: This recipe was a winner, it was simple, delicious, and took less than ten minutes of my time. Roasted sweet potatoes are always a treat, I love how the exterior puffs up and blisters while the interior melts into a decadent mash. The spice mixture was very present, but didn’t overwhelm the natural goodness of the sweet potatoes. These would be good any time of the year, but I think they’d be exceptional as part of a not-so-traditional Thanksgiving. My Dad loves to scandalize the family by messing with classic Thanksgiving dishes, and this recipe would really fit the bill. I can’t find a copy of this recipe online. Barbecue is one of those things I would dearly love to know a whole lot more about. But living in Montreal means that I’m unlikely to stumble across BBQ competitions, and there are very few pit masters looking to take on an apprentice. My lack of a back yard, or even a charcoal grill makes the situation even worse. This recipe was designed for us city dwellers who want to give apartment barbecue a try. This recipe comes as close as possible to making real barbecue without access to an open flame. It’s basically braised pork shoulder flavoured with cider vinegar, carrot, celery, onion, garlic, and peppercorns. The braised pork is doused in cider vinegar and roasted in the oven for an hour. 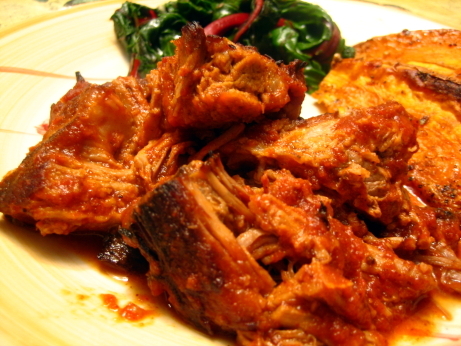 The pork is then chopped, and mixed with Tomato Barbecue Sauce and warmed through. It’s supposed to be served with white rolls and coleslaw, but it went well with swiss chard and sweet potatoes. The Good: The real plus of this recipe is that it kinda tastes like barbecue, and you can do it in the kitchen at any time of the year. The pork was moist with a nicely crisped exterior, and the long braise got a lot of flavour into the meat. I’m always a fan of using pork shoulder, because it’s very very inexpensive, and wonderfully flavourful. I think it’s got the best dollar to flavour ratio of any cut of meat out there. The Bad: Vinegar. The Tomato Barbecue Sauce was too heavy on the vinegar all on it’s own, but the pork was braised in vinegar, then roasted and basted with vinegar before being mixed with a vinegar barbecue sauce. Everyone felt a little bit pickled after dinner. The Verdict: Overall this was a fairly successful technique for barbecue without a barbecue. It utterly failed to recreate the smoky goodness of outdoor grilling, but sometimes you take what you can get. I know barbecue purists look down on liquid smoke, but I’d consider adding a few dashes when they’re not looking. The flavours in this dish were generally good, and the meat was wonderfully falling apart tender, but the acid was just too much for me to fully get behind. I’ve had a horrible case of bloggers block this summer. The enormity of my recipe backlog is paralyzing me, and I haven’t been able to wait it out. The solution as I see it is to shake things up. I’m moving to much leaner posts, more frequently, so that I can blow through this backlog, and get things back to normal. I’m usually too wordy anyway, so forced concision could be a good thing. Thanks for sticking with me through the long periods of blog silence around here. There’s no recipe for this one on Epicurious. This barbecue sauce is meant to accompany Lillie’s North Carolina Chopped Barbecue, which we’ll get to next time. It’s apparently the style of barbecue sauce popular in Lillie’s part of North Carolina, and is best served slathered over chopped pork barbecue. It probably works well on most grilled meats though. This sauce is unlike most of the barbecue sauces I’ve known. It’s very vinegary, and fairly sweet, without a whole lot of heat, and not a lot of depth. The recipe has a fair list of ingredients, but since you just stir them together and simmer for five minutes it’s not too much trouble. You just combine tomato purée, cider vinegar, Worcestershire sauce, apple juice, pineapple juice, brown sugar, dry mustard, salt, chili powder, Tabasco, cayenne, celery seed, and cinnamon in a saucepan, simmer, and apply to the protein of your choice. The recipe is really heavy on the vinegar, 3/4 of a cup compared to 1 cup of tomato purée. The rest of the ingredients are in tablespoons and teaspoons, so this ratio really sets the tone of the recipe. Cider vinegar is a little sweeter, and less acidic than many other vinegars, but that’s still makes for a very sharply flavoured sauce. The recipe describes this as a particularly sweet sauce, but compared to the BBQ sauces available on grocery store shelves it’s certainly not pushing the boundaries of sugar content. It’s a sauce to be applied near the end of cooking, or over offset heat, it will burn quickly if exposed to direct flame, but it’s by no means a candied glaze. My main issue with this sauce was a lack of depth. The ingredients mostly contributed to sweetness, acidity, or heat, precious few give the sauce body, richness, or complexity. Specifically many of my favourite BBQ sauces have a slow simmered tomato base, or include smoked peppers, and more spices. The recipe is counting on Worcestershire sauce to cover most of those bases, and while it’s a wonderful product, it just wasnt quite able to do the job on it’s own. This sauce was by no means bad, the identically named Tomato Barbecue Sauce, and Coffee Bourbon Barbecue Sacues on page 898 seem much more promising. I made a hybrid of those two recipes a couple of weeks ago to great results. If lots of vinegar, moderate sugar, and modest heat is your ideal BBQ sauce, then this is a perfectly decent way to go. It’s just not my personal preference.